(Additional note, from N6KTC, dated 8 Aug 2008, follows story). The first time you see the Diesel-electric USS Albacore, you know it's not an ordinary submarine. Its hydrodynamic blimp-like hull looks more like the body of its namesake, or a huge black dolphin or whale. From the outset it was considered ahead of its time, setting the pace for nuclear submarine designs that came later. Completed in 1953, it served for two decades as a high-speed us Navy research sub, never carrying torpedoes or heavy armament. Over the years of its service, it was modified numerous times in an ongoing evolutionary effort to increase its underwater performance. The boat's daunting 30-knot-plus speed, and its propensity to heel sharply as it turned (the crew referred to this as a "snap roll"), was apparently upsetting to many a communications operator confined to the Albacore's tiny radio room. "There were people aboard, particularly in the electronics spaces, that were scared to death at some of the maneuvers," recalls Lieutenant Ted Davis, one of the boat's pilots. 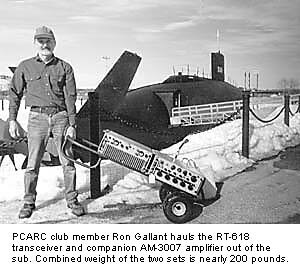 The restoration of the radio room equipment began when the Port City Amateur Radio Club (PCARC) of Portsmouth, New Hampshire obtained permission to operate from the sub during the annual "Submarines On The Air" Amateur Radio event in the spring of 2000. The Submarine Veterans Amateur Radio Association hosts this occasion. James B. Sergeant, Director-At-Large of the Historic Naval Ships Association, gave club president Paul Schreier (AA1MI) permission to temporarily install modern ham radio gear and antennas--and the sub was on the air. 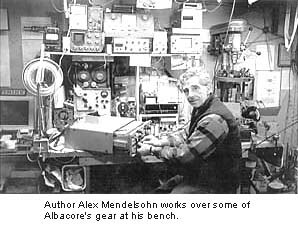 Subsequently, Schreier approached me and two other club members (W1PIE, David Sawyer and ex-submariner N1LBG, Ron Gallant) to determine if the Albacore's original equipment could be restored, and possibly be used for future ham radio operations. At first, things looked dismal. The radio room's main high-frequency receiver, a General Dynamics R-1051, was badly damaged. Its front panel was missing knobs, some of its frequency encoder shafts were sheared off, and a number of switches and controls were bent or destroyed. The remainder of the equipment in the radio room was unscathed. Nonetheless, with the exception of the boat's HF antenna tuner (feeding coaxial lines for whip antennas mounted on the conning tower, or sail) the remainder of the equipment wasn't known to be functioning. My inclination was to begin by restoring the boat's R-1051 receiver, a 1960s state-of-the-art multiple-conversion superhet. 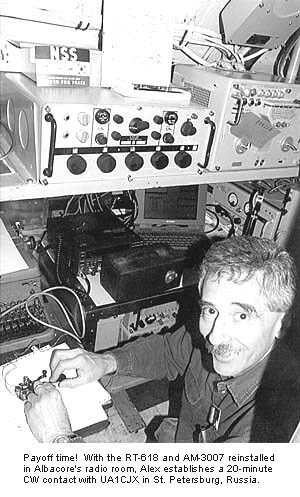 It's notable for its discrete-component frequency synthesizer and motorized band-switching, and was designed to replace the R-390 Series of tube-type receivers that were widely used by both Army and Navy. (An early Albacore wiring diagram shows an R-390A). The R-1051, and the companion RT-618 transceiver, both cover 2 MHz to 30 MHz, with separate diode-switched IF filters in the receiver sections for upper or lower sideband, CW, and compatible AM. The R-1051 receiver permits independent sideband operation, dividing detected audio into two completely independent and separate audio-output channels. These radios were designed to be relatively easy to use, with fewer knobs and controls than the predecessor R-390 and R-390A receivers. An operator would be able to select an exact frequency or channel on an R-1051 by turning individual decade knobs. The selected frequency is indicated by backlighted numerals above each of five selector knobs, two for selection of megacycles and three for kilocycles. The R-1051 relies on an internal frequency source for its phase-locked-loop synthesizer reference (an external source is an option; it wasn't used on the Albacore). One of the design goals for General Dynamics apparently was to achieve superior frequency stability over the predecessor R-390 Series receivers. The improved stability would enable reception of low speed (50 and 75 baud) encrypted transmissions using multi-tone multiplexed FSK, where stability within 3 cycles was required. In some ways, the design of these sets seems inferior to that of the R-390 Series receivers. In my experience, the latter are much easier to service. The R-1051, although highly modularized, is nearly impossible to troubleshoot at the component level. The components are almost inaccessible. Establishing operating voltages, logic levels, signal injection, and probing was a bothersome task for modules removed from the main chassis. At one point, while working on an IF strip, I had nearly a dozen test leads attached to the module. The service manuals for these sets indicate that the Navy intended that the modules be swapped for known good ones when problems arose. Defective modules would be serviced later shoreside. The verbiage in the manuals suggests that depot-level facilities were equipped with special fixtures to accommodate the modules. Possibly the difficulty in servicing these sets is what prompted Lt. Commander William P. St. Lawrence to curse the Albacore's radio equipment as "the worst in the Navy." Both the R-1051 receiver and the RT-618 transceiver use a pair of tubes in the receiver front-ends. These tubes are in the first and second RF amplifiers. The first RF stage is a 6BZ5 pentode; the second RF amplifier uses another pentode, a 6AN5WA. Almost all of the remainder of these set's stages, both digital and RF/IF, are configured with germanium bipolar junction transistors. The tube front-ends provide re-radiation isolation from the remainder of the set, a consideration that was likely a response to the Navy's need for receivers that wouldn't emit any detectable RF of their own that an enemy navigator could use to home in on. Moreover, the tubes provide a measure of protection from a nuclear explosion's electromagnetic pulse. EMP was a widespread Cold War consideration. Gilding the lily, the R-1051 also includes a separate over-voltage protection circuit ahead of its RF amplifier. It uses both avalanche diodes and a relay to protect the front-end. After a few winter months on my workbench, during which time bent pins were straightened, potentiometers replaced, operating voltages restored, and shaft assemblies re-machined and installed, the receiver was ready for reinstallation on the submarine. My attention then turned to the restoration of the kindred RT-618 transceiver, along with its AM-3007/URT amplifier, a separate deck that delivers up to 50 watts of RF output. During the refurbishment, I was surprised to find that the receiver section of the RT-618, although almost identical to the R-1051's--and primarily based on germanium semiconductors--also sported a single 2N491A field effect transistor (FET) . Even more surprising was the discovery of a 3N140 dual-gate FET. Both are used as high input-impedance oscillator buffers. This finding indicates that the set was truly leading-edge technology for its day. According to an article that appeared in the March 1961 issue of Electronic Design magazine, field effect transistors debuted commercially in that year, with the first devices available from Crystalonics, a Cambridge, Massachusetts firm. I was unable to determine the origin of the FET devices in the Albacore's radios. How much earlier General Dynamics had access to FET technology is a subject of conjecture. However, it is likely that the set's designers had access to such technology prior to its availability in the commercial world. By the spring of 2001, the PCARC restoration team was ready to activate the radio room for the 2001 "Submarines On The Air" event. In operation, the R-1051 gives a good account of itself. Although the rotating turret assembly is constructed with silver-plated phosphor-bronze contacts, it occasionally acts up, but dirty contacts aside, the receiver is sensitive and stable. For its part, the RT-618 exciter delivers about 1 W of RF, enough to drive the AM-3007 amplifier to rated output power. Mirroring the receiver, the AM-3007 amplifier section uses a concatenated pair of output tubes. An 8223 pentode drives a dual-tetrode 8116, with both tetrodes in parallel operating Class A for SSB and AM. That explains the set's huge cast heatsink! For CW, the PA operates Class C.
Significantly, a spare 8116 proved nearly impossible to find. Although calls went out far and wide for one, the best we could determine was that the tube would cost about $600 for a replacement--if one could be located. As such, the PCARC restoration team has decided to limit use of the RT-1618/AM-3007, placing it on the ham bands for special occasions only, relying instead on modern ham radio transceivers for most Amateur Radio events. On the weekend of April 28th, the PCARC went on the air with the sub's original equipment, under the club callsign W1WQM. Hopefully, in the near future, the club will use the callsign NM1JY, after the Albacore's original NMJY Navy call. Firing up the RT-618 and amplifier on 15 meters, I had a nice 20-minute CW contact with UA1CJX, Sergei in St. Petersburg, Russia. As we conversed, I imagined that it wasn't too long ago that this very rig was probably being used by an NSA/CIA "spook" to eavesdrop on Soviet conversations. In any case, UA1CJX expressed surprise to hear W1WQM from an American submarine! K1TCI reported that the RT-618 had a "distinctive, but pleasing" CW note. "Don't change anything," said Art. " It's unique." Much work remains to be done to get the Albacore's other equipment tested and operational again. The six-foot high AN/URC-32 Radio Set, built by Collins Radio, is the next candidate for restoration. It's an impressive 19-in. rack- mounted array of gear that includes equipment for receiving and transmitting over the 2 MHz to 30 MHz range using upper-, lower-, or independent-sideband modulation. It's also capable of CW and compatible AM. Its two-stage RF amplifier deck accepts a 150 mW driver signal and develops a peak-envelope power output of 500 watts. The Albacore's ELF/VLF AN/WRR-3A Receiving Set also intrigues me. Its coverage extends from 600 kHz down to a very low 14 kHz. According to Jim Sergeant, this set was used to intercept alert tones and slow-speed data transmissions, while the Albacore was submerged. The sub's UHF short-range communications equipment is fascinating as well. The AN/URR-13 Radio Receiving Set and companion CAY-52373A Radio Transmitter cover 220 MHz through 400 MHz. This equipment would also lend itself to operation in the Amateur Radio bands, albeit for local ham radio contacts only. 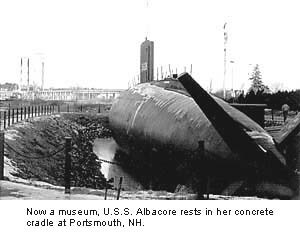 If you're in northern coastal New England, plan on visiting the USS Albacore. It's open weekdays and weekends for self-guided walk-through tours. Call the Friends of Albacore at (603) 436-3680 for more information. If you have questions, comments, corrections, or additional information about the USS Albacore's radio room and communications systems, please contact the author or the Port City Amateur Radio Club. Robert P. Largess and James L. Mandelblatt, U.S.S. Albacore, Forerunner of the Future, 1999, The Portsmouth Marine Society, ISBN 0915819-24-4, p.66. radioman (1967-90) it brought back a flood of memories. thereafter, using secure DPSK for both data and voice. submarine on the surface heels away from the direction of a turn.